As a business owner and mom of three active boys—ages 8, 6 and 2—Casey Soer barely has time to focus on herself. Like so many busy parents, her life is filled with happy chaos: drops-offs and pick-ups, play dates, doctor’s appointments, grocery shopping, cooking and of course, managing Spynga—her original baby—which includes running a successful studio while simultaneously gutting out and building a shiny new space (to be revealed in just a few weeks!). I am often asked by new students how many times a week should they practice to “nail” their chaturanga, arm balance or inversion. My answer is always the same. Be safe and start slow. Practice once or twice a week, see how the body feels and increase the days of practice from there. The benefits of a regular practice go far beyond perfecting a plank, crow or handstand. How The Hollow Body Position Has Changed My Life! I am not a gymnast, I have never been a gymnast, nor will I ever be a gymnast!!! However here I am at 41 obsessing with handstands and handstand walking. It wasn’t until I mastered the hollow body position that this dream became a reality. I am actually walking on my hands!!! @jillrs75 Achieving this goal of mine would not have been possible without the time and dedication spent perfecting a solid hollow body position. So what is it? It is basically one of the hardest elements I have incorporated into my training and my classes. I am not saying this to scare you but to prepare you for what will be a rewarding yet huge challenge. So picture the shape of a banana or a hammock, this is the image you want to match when performing your Hollow. If you follow the instructions below point by point you can and will Hollow! Training Pairings: What to eat after your favourite workout! You exercise hard you, take care of your body but you are still stuck with what the heck to eat after your spin class, yoga class or strength training session. All that hard work won’t pay off if you just throw back a macchiato and an energy bar. This is not how you “get in shape”. Your results will only surface if you eat what your body actually needs and what it will thrive on after your workouts. Spynga is special. It’s so much more than a studio to take a yoga or spin class. Spynga is a community of people that care. I’ve learned this first hand while undergoing breast cancer treatment over the past several months. I felt like I had my very own cheering squad, pushing me through to the end of my treatments. There would be days when I would not feel great but I knew that if I could make it to a class, I would always feel better. Clients and staff would always offer words of encouragement, share personal stories and ask how I was doing. This caring community spirit helped get me through one of the most difficult periods of my life. Thank you from the bottom of my heart! 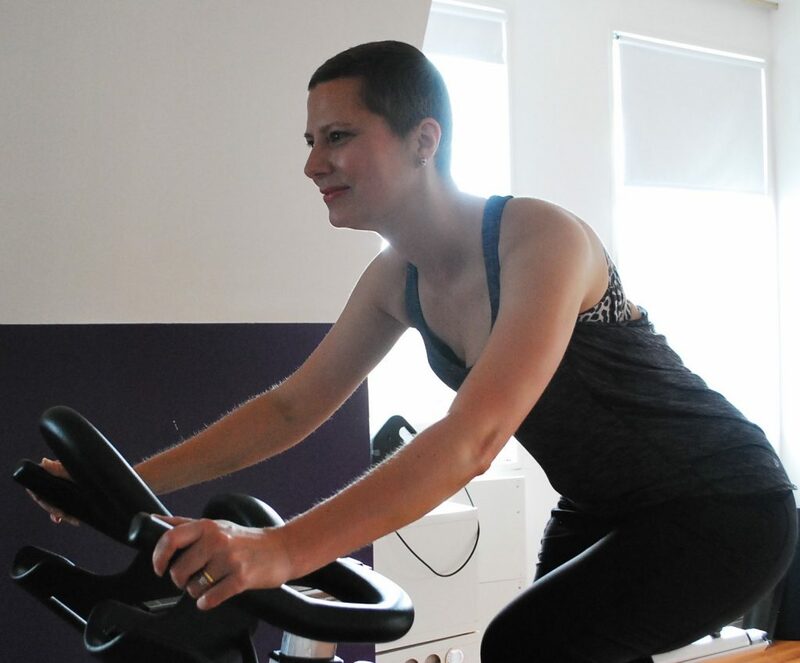 I was in the best shape of my life when I was diagnosed with breast cancer. I had spent the previous two years getting “fit for 40”. My plan was to spin, sculpt and sweat my way into the next decade. My birthday came and I never felt better. I had achieved my goal! I was fit at 40! However, a few months later my world would be turned upside down when I was diagnosed with breast cancer. At my annual physical my doctor found a lump and a biopsy was done the next day. Five days later I received my diagnosis and I was in complete shock. I was scheduled for surgery and was told that I would be undergoing chemotherapy and radiation treatments. I couldn’t understand how a fit person that has a healthy diet and feels great can be diagnosed with breast cancer. My oncologist told me that because I was younger than the average patient and because I was physically fit I would have an easier recovery. I would soon come to realize that achieving my “fit for 40” goal would mean much more than looking good in a pair of skinny jeans. Being fit provided me with the foundation for a quick recovery from major surgery and the ability to tolerate months of cancer treatments. My Cleanse for life story starts before I met Dr. Jodi Larry. 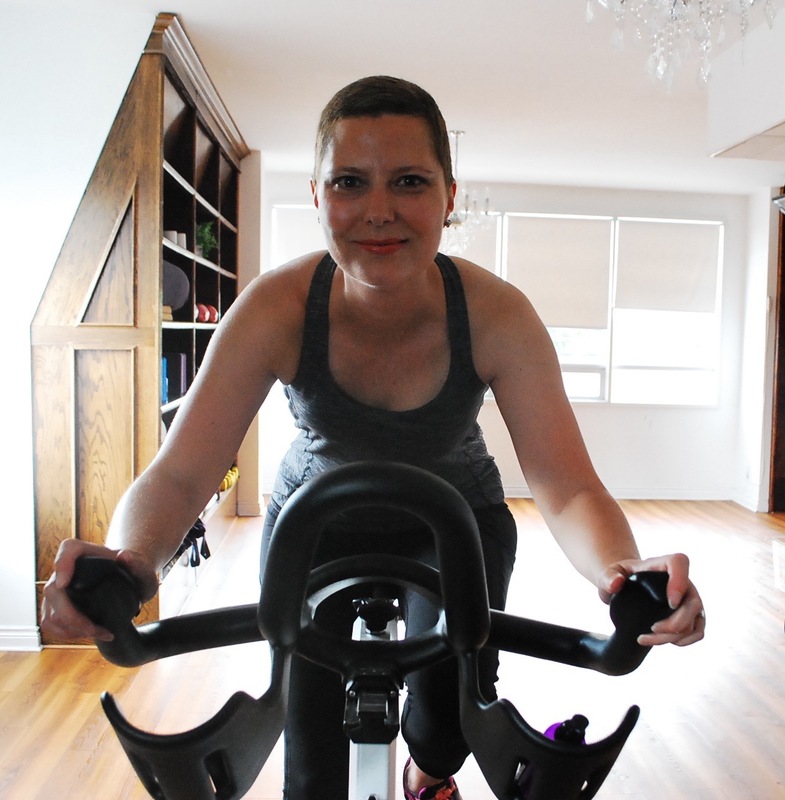 In April of 2014 I began spinning at Spynga as a way to train for the Ride to Conquer Cancer. Spynga gave me a comfortable place to workout. The exercise felt different. The space felt warm and welcoming and I wanted to be there. I spent time on the bike thinking about my intention, I yearned to do yoga, but truly felt I couldn’t. In spin class I was hearing about gratitude and setting intentions, and I was finding that my mind was thinking about these ideas as well as patience both on and off the bike. I was starting to think more about how I could take care of myself, and what I really needed to do for me. That summer I began following Jodi’s posts. Friends of mine had participated in the Cleanse for Life program and said it was great. I thought that maybe it would help me lose unwanted weight. Like yoga, I was pretty sure I couldn’t do it. I couldn’t give up sugar and crackers and cheese – not even for 10 days. But, somehow I found the courage and I signed up to cleanse. berating yourself for not DOING IT! Motivation is crucial as a starting point. Motivation is the missing piece for a lot of people. So, a good idea is to think in terms of building new healthy habits. If you think about any of the habits you already have, they’re not hard to do, in fact they probably require little to no motivation at all. Below are some advice, tips and techniques to help you get motivated to work out and form those healthy new habits. This will lead you to getting fit and keep you on track with your fitness goals. So if you’re ready and motivated, read on! At seven-weeks post baby, I woke up and no body part was screaming pain. Sleep deprived, yes, but I can cope with the fatigue much better if my body is not in any pain. 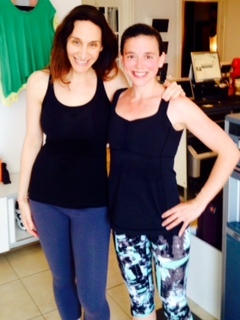 After trying my first yoga class last week, I though I would brave the bike. I have to admit, I was scared to even sit on the saddle, afraid of reliving parts of childbirth and embarrassing myself with the thought of not even getting through the class! I went to a dear friend and staff member’s class, Joanna, who is a mother of two as well. Comforted by knowing her style of teaching which is commanding, high energy as well as inclusive of all riders, I knew it would be a good class to find my legs again. I sat next to loyal client who comes to Spynga 3 x a week and is there to work hard. She was my secret inspiration to keep pace with. Truthfully, I was just happy being in the excitement of a cycle class again. Those who are indoor riders seriously love the endorphin rush, music and challenge of it all, not to mention the continued results they see and feel in their body. So here I am reemerging from the newborn baby bubble at 6 weeks post- pardum where, I think, you can finally semi catch your breath. Recovery from the wild ride of labour and delivery is hopefully becoming a distant nightmare or dream, depending on your experience and your body is healing, at least on the surface. Personally, I am knee deep in sleep deprivation mode where it is natural to feel like you have left your brain on most days and where 2-3 hours of snooze time feels like you drifted off for just a moment. Since my mind has been mostly occupied with feeding, poop, devising inventive ways to settle a fussy infant, and incorporating a toddler into this all – It was sadly foreign albeit natural, to turn my attention inwards. I took my first breath with a vinyasa level 2 yoga class yesterday and besides reliving moments of childbirth again in certain poses, it was incredibly humbling on the mat for this veteran teacher and student of yoga. I have been stretching periodically since giving birth to Theodora. Mostly a few sun salutations to shake out the legs from sitting and nursing, forward folds with arms following over head to reverse my caved in chest from hovering over baby day in and day out, breathwork to get through the initial pain of breast feeding and meditating any chance I get….or is that sleeping?